You are here: Home / WordPress Design, Development & Maintenance Tips / How Long Does it Take to Create a Website? 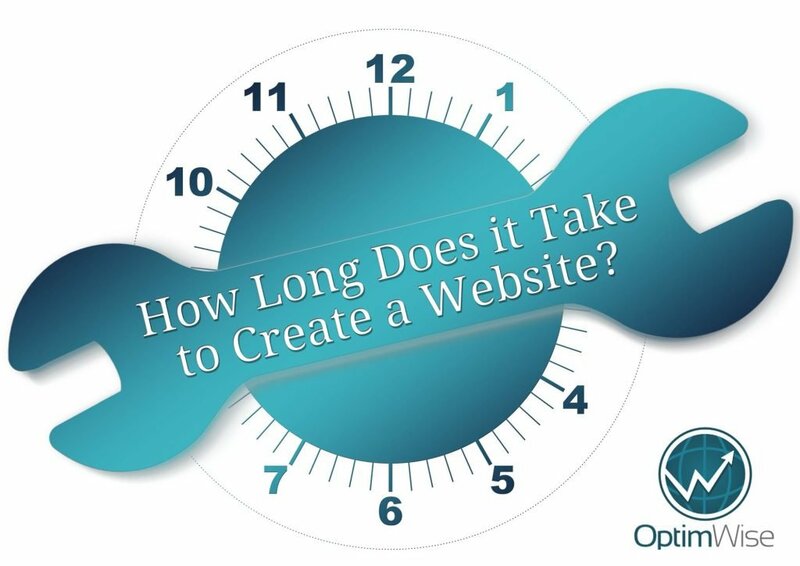 One of the questions we are frequently asked is, “How long does it take to create a website?” In reality, we should ask you, since you determine the project and pace more than we do! What do we mean? Let’s say you wanted to build a custom house. If you went to a builder and told them a few details about the house you wanted, then went on vacation for 6 months, how far along do you think the house would be when you returned? Not very far, because the builder needs a lot of info from you, and also needs you to provide feedback and give approval on decisions. They’re the expert in building houses, but they still need you involved to bring the home to reality. In the same way, building a website is a cooperative effort. We need you to be involved! What Do We Need From Our Clients? Since you will be helping us gather all the information we need to create your site, here is a list of things we will need to build a standout website for your business. The more quickly these items are returned to us, the sooner your website will be complete. Signed Agreement: The first step of the process will involve working together to determine the scope of the project. Once we have agreed upon the expected end result, we’ll ask you to sign an agreement to begin our work together. We cannot begin work on the project until we have the agreement signed. Fortunately, you can sign in seconds right from your browser! Content: Great content is the most important part of a website. We will need your input on what text and images to include in your website. This is the part of the project that usually takes the most time, especially copywriting and editing. Our team of experts will help you through this process, but it is not something we can do without your assistance. Feedback and Approval: Throughout the process, we’ll need your feedback and approval. We’ll ask for it on aspects of content, design, and functionality. We want you to be 100% satisfied with the end result of your website. We find our clients are the most satisfied if we communicate and ask for their input and approval along the way. Provide Access to Host and Other Accounts: If you already have a website set up, we will need access to your web host and possibly other items such as a WordPress account, Google Analytics, and MailChimp. We believe it’s best for you to own your accounts and just give us access. When our clients are responsive and provide us with valuable feedback, we find their sites are completed much more quickly than when they stall. We try to get as much as we can up front and to push the process along, but there’s only so much we can do without your cooperation. Sadly, we’ve had a few projects that go several months past their due date because the client won’t reply to us or provide what we need. This isn’t just a problem for us, it’s bad for the client, because they miss out on months of generating leads (which hurts sales)! Although much of what we need to build a website comes from our clients, some things depend on us. When we can start will depend on our workload (how many projects we’re already working on). We will be transparent with you about this as we begin the project. The complexity of the site will also contribute to how long it takes to create it. Some factors that can make a website more complex are ecommerce functionality, custom themes and plugins, number of page layouts, etc. We will do our best to evaluate your requests and then determine an estimated project timeline. We often see clients who are more concerned with getting a site created quickly than correctly. Even though we understand that sometimes there is an urgency for completion, we always caution our customers to focus on getting the work done right, not fast. Rushing through the process can lead to poor results and oversights. This also applies to the sales process. We place great emphasis on taking the time to discover all we need to understand to provide you with a website which will meet all your needs and which you’ll love. Looking to build a new website? Let us help you create the professional site your business deserves. We promise to work swiftly and thoroughly on your website. And as a bonus, we’ll have fun along the way too! Contact us today to get started.